The Story of Ānanda Balāsana (Happy Baby Pose): Before dawn, it is the darkest night. Before being delivered, the baby needs to go through the narrow dark birth canal to come to this world. 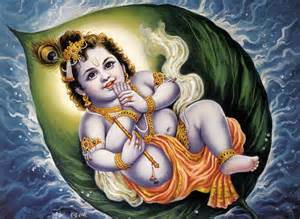 The story of Happy Baby relates to Mukunda, the one who gives liberation to the spiritual practitioner. A learned sage, Mārkaṇḍeya Ṛṣi is meditating at the bank of a river. A strong fast wind suddenly arises. The wind creates a terrible sound and black clouds obstruct the sun and hurls lightning in every direction. Rains are pouring down, and the world is all covered by water. This is the final dissolution of the world. Mārkaṇḍeya Ṛṣi sees all the inhabitants of the universe, including himself, submerged in the water of inundation. As the whole world is flooded, he becomes fearful and loses consciousness. He experiences lamentation, bewilderment, misery and pain. He feels himself dying. He is left wondering like this for countless years. Suddenly, amongst all the confusion, Mārkaṇḍeya Ṛṣi notices a banyan leaf floating on the water, tossed by the waves. On this unlikely raft lies a beautiful and adorable child sucking his right toe, unperturbed by the calamity that has befallen the world. It is Mukunda who frees us from illusion. The infant's heavenly smile negates the brutality of the cosmic deluge. His compassionate glance reassures Mārkaṇḍeya Ṛṣi that this is not the end of the world, but beginning of a new life.